This 2 month old boy presented to Dr. Maulin shah with clubfeet deformity. He got corrected in 9 weeks time with absolutely normal feet architect without any surgical intervention. Timely presented patients of clubfeet can be treated without surgery. 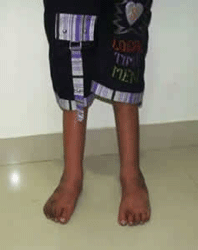 This 5 years old boy never received treatment for clubfeet. His deformities worsened gradually before he presented to Dr. Shah. After surgery he achieved almost normal feet shape & function.